Fig. 3-3. 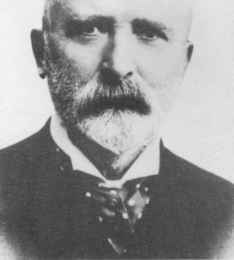 Rutherford Morison (1853-1939). 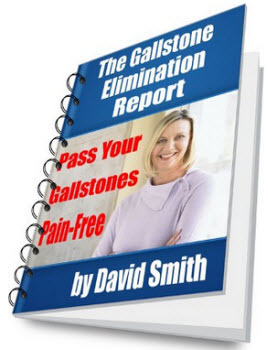 Morison, an English surgeon, is best known for the pouch that he described in The Anatomy of the Right Hypochondrium Relating Especially to Operations for Gallstones in 1894. He emphasized that "bile leaks drain into this area but the external drain must extend to the very depths of the pouch." 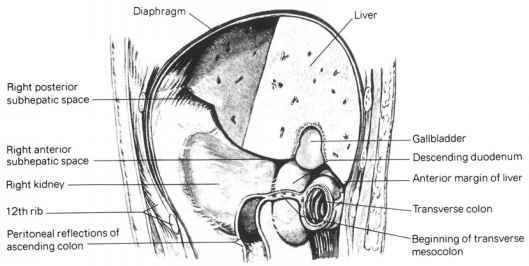 My view is that the subphrenic region extends from the diaphragm to the transverse colon and mesocolon. It is divided into the suprahepatic and infrahepatic compartments by the liver. The suprahepatic compartment is divided into right and left portions by the falciform ligament and the infrahepatic compartment is similarly divided by the ligamentum teres and ligamentum venosum. Fig. 3-4. 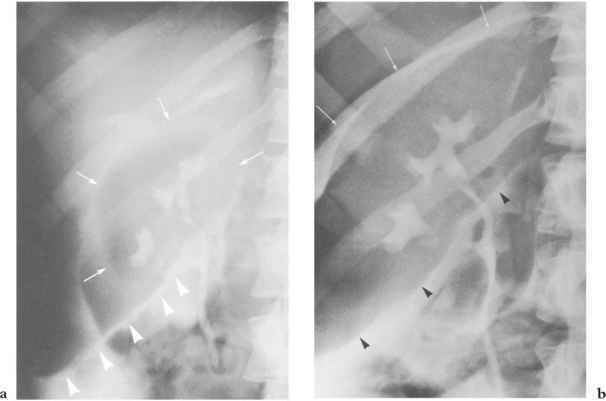 Reflections of the right coronary ligament (arrows) suspending the right lobe of the liver are outlined by free peritoneal air in the lateral view. The inferior leaf is at the level of the 12th rib. 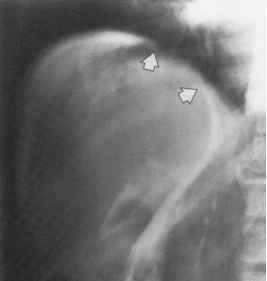 The nonperitonealized bare area of the posterior surface of the right lobe lies between the reflections of the ligament. Fig. 3—5. The reflections of the right superior and inferior coronary ligaments (arrows) are outlined by in vivo contrast peritoneography. Between them is the nonperitonealized bare area of the right lobe of the liver. The right subhepatic and subphrenic spaces are distinguished. Fig. 3—6. Right parasagittal anatomic section. The right coronary ligament suspends the liver from the diaphragm posteriorly and divides the peritoneal cavity around the right lobe into a subphrenic space and a subhepatic space. 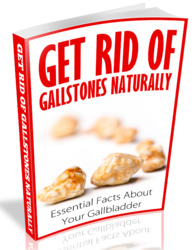 Gb = gallbladder; HC = hepatic flexure of the colon; K = right kidney. this way, the peritoneal recess around the right lobe of the liver is grossly compartmentalized into a subphrenic space and a subhepatic space (Fig. 3-6). Underlying the visceral surface of the right lobe of the liver, the right subhepatic space is composed of two compartments (Figs. 3-7 and 3-8). 1. The anterior subhepatic space is limited inferiorly by the beginning of the transverse colon and mesocolon. 2. The posterior subhepatic space lies in close relationship to the posterior parietal peritoneum overlying the right kidney. It projects upward in the form of a recess between the renal impression of the liver in front and the upper pole of the right kidney behind. The postero-superior extension of the right subhepatic space to its margination above by the right coronary ligament is known anatomically as the hepatorenal fossa and clinically as Morison 's pouch. Fig. 3—7. Right parasagittal diagram. 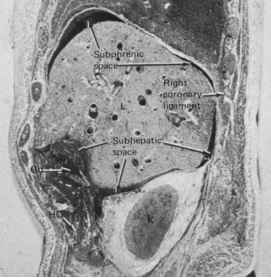 The right subhepatic space is composed of anterior and posterior (Morison 's pouch) compartments and is anatomically continuous with the right subphrenic space. The reflections of the coronary ligament mark the site of the nonperitonealized "bare area" of the liver (L). K = right kidney; A = adrenal gland; D = descending duodenum; C = transverse colon. Fig. 3—8. Right parasagittal anatomic drawing, viewed from the right. The relationships of the right anterior and posterior subhepatic spaces are shown. Morison's pouch is of great significance in the spread and localization of intraperitoneal infections since it is the lowest part of the right paravertebral groove when the body is in the supine position. Figures 3-9 through 3-11 illustrate its important anatomic relationships. In-feriorly, it is bounded by the hepatic flexure of the colon and the peritoneal reflections at the beginning of the transverse mesocolon and medially by the second por tion of the duodenum as it descends anterior to the hilus of the kidney. Laterally, it communicates deep to the liver around the margin of the right coronary ligament with the subphrenic space above and the right paracolic gutter in the flank. Although these two compartments communicate freely anatomically, they are frequently separated by the development of pyogenic membranes (Fig. 3-12). Fig. 3—9. Frontal view of the anatomic relationships of Morison 's pouch facing the deep visceral surface of the right lobe of the liver. Fig. 3—10. Visceral surface of right lobe of liver. (a) Supine peritoneography. Positive-contrast medium parallels the posteroinferior edge of the liver (arrowheads). 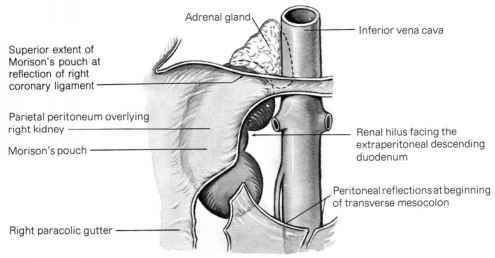 Gas within Morison ' s pouch outlines the contours of the renal fossa on the posterior surface of the liver (arrows). (b) Prone peritoneography. The inferior reflection of the coronary ligament, immediately below the bare area of the liver marking the superior extent of Morison 's pouch, is outlined (upper arrows). Note that here it corresponds to the level of the 11th posterior rib. Positive-contrast medium also pools along the notched anteroinferior border of the liver (arrowheads). Fig. 3-11. Fluid-filled Morison 's pouch. 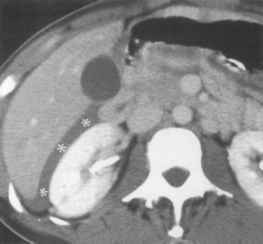 Ascites occupies the hepatorenal fossa (asterisks). The right subphrenic space is a large continuous compartment extending over the diaphragmatic surface of the right lobe of the liver to its margination posteriorly and inferiorly by the right coronary ligament. No true anatomic separation into anterior and posterior sub-phrenic spaces actually occurs, but such compartmen-talization of abscesses frequently takes place by the formation of pyogenic membranes (Fig. 3-12). The falciform ligament separates the right and left subphrenic spaces. Mitchell11 has stressed that the region below and on either side of the free margin of the falciform ligament resembles a delta in which the two sub-phrenic and the right subhepatic spaces communicate. The suspending coronary ligament of the left lobe of the liver, unlike the right, is attached superiorly, almost in the center of the abdomen and more anteriorly than the right coronary and triangular ligaments.11,15-17 It is quite small and usually insignificant for the margination of abscess cavities. The anatomic spaces surrounding the left lobe of the liver are thus freely communicating (Fig. 3-13). 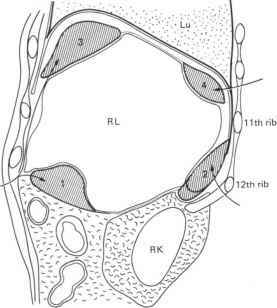 Generally, therefore, the whole left side should be considered as one potential abscess area.12,13,15 The mesenteric attachments of the left upper quadrant, i.e., the splenorenal ligament, the gastrosplenic ligament, and the lesser omentum, aided by the development of inflammatory adhesions, may serve to compartmentalize abscess to the immediate subphrenic (between the diaphragm and the gastric fundus), subhepatic (between the visceral surface of the liver and the stomach), or perisplenic areas (Fig. 3-14). Fig. 3—12. The four sites of localized abscesses around the right lobe of the liver. ment.18 (Figs. 3-14b through 3-20). This is a strong falciform peritoneal fold that extends from the anatomic splenic flexure of the colon to the diaphragm at the level of the 11th rib. Older literature refers to it also as the "sustentaculum lienis," since it is in immediate inferior relationship to and serves the purpose of supporting the spleen at its tip.20 Its importance in limiting the spread of infection is based on the anatomic fact that it separates partially the perisplenic space from the left paracolic gutter. Where is the right subhepatic region of the body?